BRO-TV: The Future of the White Blaze from Blue Ridge Outdoors on Vimeo. Since Benton MacKaye first conceived the notion of a continuous Appalachian footpath 94 years ago, the AT has changed and evolved immensely. In its earliest years the trail saw very little foot traffic and fell into a continuous state of disrepair. As evidenced by Earl Shaffer’s account of the first-ever thru-hike, the trail that existed in the late 1940s was a fragmented and unmaintained version of today’s A.T. It wasn’t until 1968, when newly-appointed Secretary of the Interior Stewart Udall passed the National Trail Systems Act, declaring the A.T. a unit of the national park system, that its future was truly secured for future generations. After the government stepped in, the A.T.’s notoriety began to spread and thru-hiking grew in popularity. Today, an estimated that three million people walk a portion of the trail every year and 2,000 attempt or actually complete an end-to-end thru-hike. IS THE A.T. ABOUT TO HAVE ITS “WILD MOMENT”? After the 2014 release of the movie Wild—a film that chronicles the real-life experiences of a once-troubled author as she finds redemption via thru-hiking the Pacific Crest Trail, the footpath saw a 30 percent uptick in hikers. Ron Tipton and others are predicting that the AT will soon have its own Wild moment as inspired fans of A Walk in the Woods take to the trail to experience it for themselves. The question is: will the Appalachian Trail, a trail already known to have crowded shelters and summits, be able to sustain a dramatic surge of hikers? “Increased use on the A.T. is a great thing, but it’s extremely important that new hikers understand the importance of Leave No Trace principles,” says the ATC’s Ron Tipton. Those principles include: disposing of waste properly, camping on durable surfaces, leaving what you find, minimizing campfire impacts, respecting wildlife, and being considerate of other visitors. One person who is doing his part to educate A.T. newcomers about the importance of trail conservation is Asheville, North Carolina native Mark Hanf. Hanf has developed a board game designed to educate hikers and would-be-hikers alike about the nature of preparing for a thru-hike. Tenets of “The Appalachian Trail Game” include wildlife and plant life identification, basic first aid tips, packing techniques, and, most important to Hanf, Leave No Trace ethics. Hanf is donating 5 percent of proceeds to the Appalachian Trail Conservancy. Help support Mark’s efforts to conserve the A.T. by check out his Kickstarter campaign! GLOBAL WARMING AND THE A.T. The global effects of climate change have not been lost on the Appalachian Trail. Warming temperatures make drought more likely, compromising essential backcountry water sources that thru-hikers depend on, while more intense weather events like Hurricane Sandy, which threatened A.T. hiker back in 2012, lead to more trail erosion and blowdowns. Climate change also facilitates the spread of invasive species like the hemlock wooly adelgid that’s been decimating hemlock trees along the A.T. while unnaturally altering the distribution of other plant and wildlife species. According to the ATC, there are already changes evident in the way humans experience the trail. Many hikers are now starting two weeks earlier than in years past in order to adjust to an earlier spring. Most of the conservation conundrums facing the A.T. today were brought about by humanity’s overuse and destruction of the environment, but at least one ecological issue has arisen as a result of our withdrawal from the Appalachian mountains. 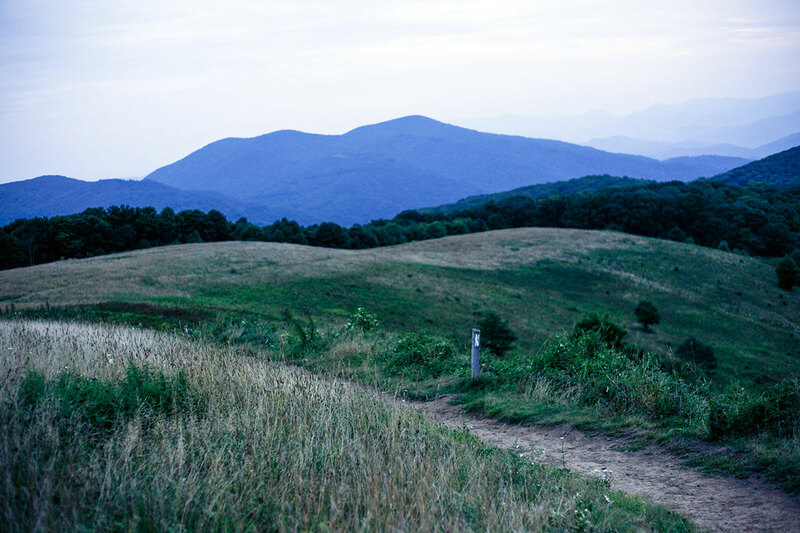 Southern Appalachian balds, such as those found in the Roan Highlands along the North Carolina-Tennessee border or the Grayson Highlands of Virginia, offer hikers unparalleled views of the surrounding mountains because of their unique treeless landscape. These balds are subalpine meadows harboring certain species of plants found nowhere else in the southern mountains. But the unique experience afforded by Southern Appalachia’s subalpine balds may not last. The origins of grassy balds is a matter of debate, but most believe that they maintained their treeless landscape with the help of livestock owned by early European settlers. In the absence of livestock and the prehistoric grazers like mastodons and mammoths that are believed to have preceded them, trees and large shrubs are attempting to reclaim the balds and in some places already have. If this growth is allowed to continue uninhibited then the balds, viewed by many as living relics of Southern Appalachia’s prehistoric past, could be lost forever, taking rare plants and animals with them.